The Belén is a district of the Amazonian city Iquítos, Peru; the city being accessible only by boat or plane. There, everything is built to float. I visited in the southern hemisphere summer, when the rivers were low. When the waters run high, the banks extend a few hundred metres up to a market. The market was undoubtably the worst smelling place I have ever been, which gave me very little confidence to try the food. But it was strangely fascinating, chickens were cut open in strange ways and left so that you could see eggs forming inside of them. All kinds of meat were available: fish (also cut strangely), caiman, turtles and some that I either didn't know or couldn't recognise. My favourite was the natural therapies/magic section . 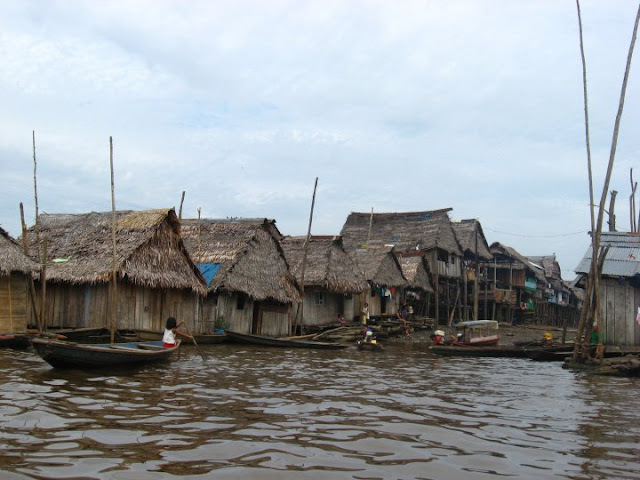 When the river levels are up, everything is afloat, even the market, all of the Belén is on the river, and the only way to get around for the shanty town's thousands of occupants is in boats.